Casio introduced a new smartwatch, GPS watch, and action camera, all of which have a rugged design intended for heavy outdoor use. Casio announced a few new devices at CES this year, and they all center around the great outdoors. The first is a new GPS watch. While it lacks the "smart" capabilities of some of Casio's recent offerings, it nonetheless packs quite a bit of tech. 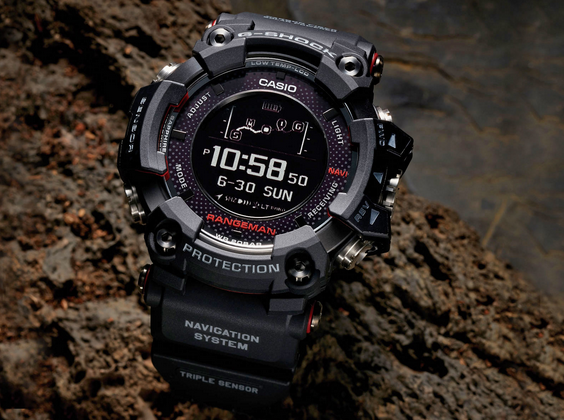 The G-SHOCK Rangeman GPS Navi watch, as its name suggests, puts GPS navigation and 3D log mapping on a wearer's wrist. The Rangeman GPS Navi connects via Bluetooth to the user's smartphone and sends mapping data to the G-SHOCK app. Using the app, wearers can also create their own routes, set alarms, change the time, and log travel. The timepiece also brings the usual smattering of G-SHOCK features: Casio's Triple Sensor tech (altimeter/barometer, compass, and thermometer), mud resistance, deep-water resistance, low-temperature resistance, a sapphire glass crystal, and info on tidal and moon phases. 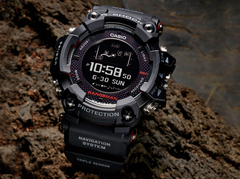 The G-SHOCK Rangeman GPS Navi will be available through Casio in April for USD $800. For those that want more brains in their rugged watch, Casio introduced a limited-edition color of their WSD-F20 Android Wear smartwatch. The WSD-F20WE features a white base coat "inspired by the color of crystalline fluorite." The new color scheme comes with a new watch face for their Android Wear smartwatches, dubbed "Journey." The new watch face displays the wearer's current location underneath an analog-style time display. The watch face can also sync to the wearer's Google Calendar and display a map of upcoming events. Lastly, Casio is entering the action camera market with the G'Z Eye Action Camera. The GZE-1, Casio's first action cam model, is shock-resistant, waterproof, and dustproof. Casio took design inspiration from its G-SHOCK line of tough watches and Outdoor Recorder line of outdoor digital cameras. There's sparse information on the more pertinent specs, such as resolution, color profile, lens type, and battery runtimes, but Casio may release more information in the near future. LAS VEGAS, Jan. 9, 2018 /PRNewswire/ -- Casio America, Inc. is excited to announce that it will exhibit an expanded portfolio of products during the consumer electronics industry's largest tradeshow – CES 2018. The Company's new G-SHOCK Rangeman GPS Navi Watch, PRO TREK WSD-F20 Smart Outdoor Watch, G'Z Eye Action Camera, and more will be on display in the company's booth in the Central Hall of the Las Vegas Convention Center (#14006) from January 9-12, 2018. "Innovation and our dedication to provide consumers with products that will positively impact their lives is what we are excited to showcase at CES 2018," said Yuji Sasajima, CEO of Casio America, Inc. "From our latest G-SHOCK Rangeman equipped with GPS, and limited-edition PRO TREK Smart Outdoor Watch, to a game-changing action camera for the outdoor adventurer, Casio's products are the perfect combination of smart and functional. Our expanded portfolio at CES will solidify Casio's continuing efforts to provide consumers with products they both want and need." Expanding on its namesake MASTER OF G line is the all-new Rangeman GPS Navi timepiece. Equipped with triple sensor technology (altimeter/barometer, compass and thermometer) and featuring mud resistance and low-temperature resistance, the new Rangeman connects to the G-SHOCK app via Bluetooth to allow 3D log mapping to route every adventure. Outdoorsmen and urban explorers alike can utilize GPS navigation to log travel and track progress all while maintaining most accurate timekeeping and keep an eye on their destination goal. Logged data can also be transferred wirelessly via Bluetooth from the watch to the user's smart phone utilizing the G-SHOCK smartphone app, where users can create navigation routes, as well as set alarms, time and select world time cities. Each timepiece boasts a carbon-fiber insert band in black (GPRB1000-1) or olive-green (GPRB1000-1B), stainless steel black IP buckle and bezel, sapphire glass crystal, high-contrast LCD, and super LED backlight, in addition to tide and moon data. The GPRB1000-1 and GPRB1000-1B will each retail for $800 beginning in April 2018 at G-SHOCK retailers, www.gshock.com, and the G-SHOCK Soho Store. The PRO TREK WSD-F20WE is a limited-edition color model of the award-winning WSD-F20 series, featuring white as a base color to provide an accent to colorful outerwear. This new color scheme is inspired by the color of crystalline fluorite, which is sometimes used as a raw material in outdoor wear. The white color features a clear-coat to give a deep multilayer finish with crystalline-like depth. Casio is also releasing a new watch dial called "Journey" that makes travel even more fun. "Journey" shows a map of the current location in the background of the analog-style watch display. When users save events with locations to Google Calendar, the watch displays up to three upcoming events and a map of the next scheduled destination. Users can save destinations beforehand from an itinerary, such as outdoor destinations or sightseeing spots, so that they always have a view of the next destination. "Journey" can also be installed on the WSD-F20/F20S/F20X models. In addition to its timepieces, Casio is also showcasing the new G'Z Eye Action Camera. The G'z EYE brand of tough cameras are designed especially for shooting extreme sports in harsh conditions. The first camera to be released is the GZE-1, which features a shock-resistant, waterproof, and dustproof construction, developed by leveraging the expertise Casio has amassed with its G-SHOCK brand of shock-resistant watches and Outdoor Recorder series of detachable digital cameras for the outdoors. Casio's 2.5D Printer system enables science, math and geography curriculums to take on a true "touch and feel" learning environment that provides the ability to physically experience the tactile values of shapes, sizes and graphic elements in a dimension context that can be used by both teachers and students. The new educational technology platform provides content for educators that meets the special needs of a visually impaired student and enables them to adjust the curriculum based on the student's learning speed. By using this technology, students will have a greater opportunity to expand 'self-study' and 'shared study' and the 2.5D Printer system will introduce a physical dimension to the learning process. These are just some of the innovations Casio will be showcasing at CES. To see even more, be sure to visit Casio's booth (#14006) during CES 2018. For additional information on Casio's portfolio of consumer electronics products, please visit www.Casio.com.